Just a couple of weeks ago, the Fed announced that it had cracked down on more than 530 mortgage scammers nationwide. The most common foreclosure scams are phony counseling or foreclosure rescue services where scammers promise to modify or revoke a loan in arrears, for a high upfront fee. Scammers have also been known to pose as loan auditors, government officials from modification programs, or lawyers looking to file a mass lawsuit. Housing counselors and resources should be deployed to combat these scam artists. Foreclosure scams are especially prevalent in Prince George’s County, according to the Coalition for Homeownership Preservation in Prince George’s County. The county may be targeted by scammers because many families there are in the process of foreclosure. Between third quarter 2011 and third quarter 2012 alone, 14 percent of all homes in Prince George’s County received a Notice of Intent to Foreclose (NOI). In the third quarter of 2012 alone, 6,363 homes in Prince George’s County received NOIs (2.9 percent of all homes). This is a 3 percent increase from the previous quarter. Some areas of Prince George’s County have exceptionally high NOI rates. 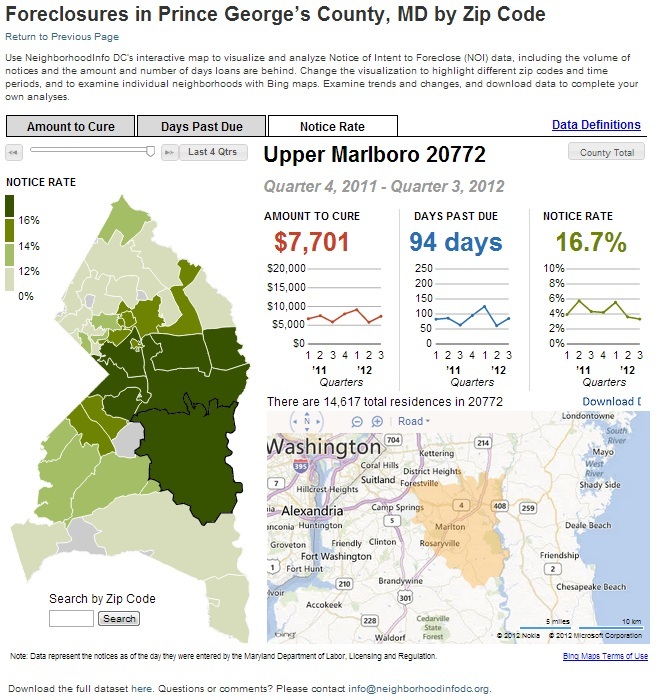 Areas with the highest rates, marked by the darkest colors in the interactive map below, include Landover (20785), Capitol Heights (20743), Forestville (20747), Upper Marlboro (20772 and 20774), and Bowie (20716) in the central part of the county. These ZIP codes have NOI rates ranging between 3.3 percent and 5.3 percent of properties foreclosed on in the past quarter and 16.7 percent and 24.4 percent in the past year. These ZIP codes have ranked in the top 10 highest NOI rates of all Prince George’s County ZIP codes for each quarter for the past 7 quarters. Targeting resources and housing counselors to these areas could help limit the number of homeowners affected by mortgage scammers. NeighborhoodInfo DC will continue providing quarterly updates of the foreclosure situation in these hard-hit ZIP codes and in all of Prince George’s County. These updates aim to inform the conversation among community leaders and elected officials on how to best distribute the nearly $1 billion in settlement funds and the limited resources of housing counselors to combat foreclosures and mortgage scammers. Click here to view maps and data on NOIs, including amount to cure (the amount owed by the homeowner) and days delinquent, in Prince George’s County. I would like to know home many of the foreclosures were subprime mortgages and issued by what banks. This is a good article. I am a doctoral researching the PG County foreclosure issue.